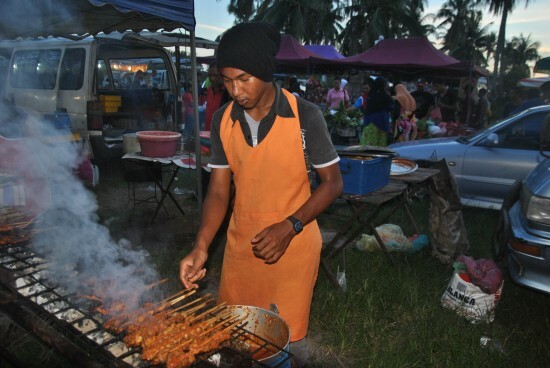 Night markets are a regular occurrence across Langkawi, with these culinary venues being scheduled every night of the week in various parts of the island. They usually start hopping at 17:00 and continue late into the night or when vendors sell out. The vendors are consistent in their appearances, being in tune with what’s popular with which particular areas of the island. While few of the markets extend their stock into toys, clothing and household decoratives, all will have an abundance of favourite local foods. Nothing draws a crowd better than the aroma of food. 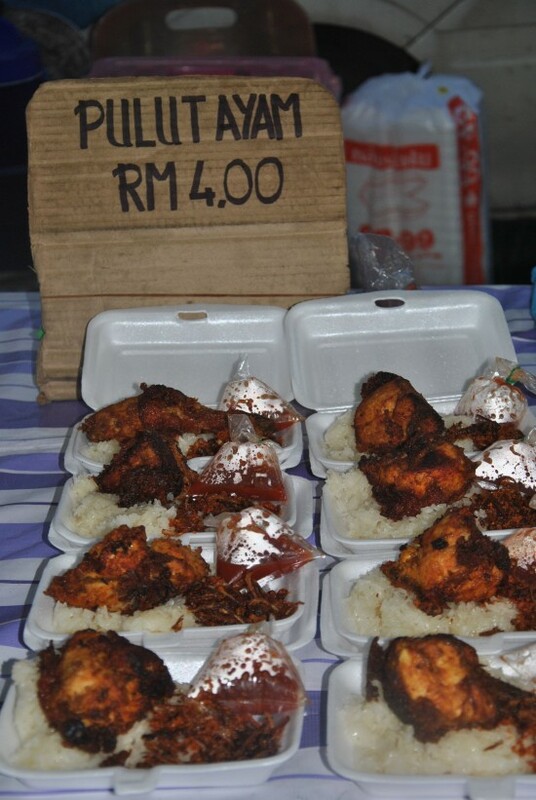 Pre-prepared grab and run meals of pulut ayam or nasi ayam cost 4 ringgit or you can go ala carte. Most items are 2-4 ringgit and are packed up nice and neat in non-eco friendly plastic bags or styrofoam. In fact, the popular double bagging method will help to insure that you will use the maximum amount of non-biodegradable packaging in order to see your take away items arrive safely at your destination. Bringing your own tiffin or re-usable bag is always an environmental plus, especially on an island. In addition to local recipes up for grabs, often the latest in-season fruits make their appearance at bargain prices. And with the amount of long and short term tourists frequenting the night markets, there’s usually someone to help you make your selections based on their own personal recommendations. Or perhaps even take a photo of you when trying Durian for the first time! This tourist can’t decide if Durian is indeed the “King fruit” or not. There are three night markets scheduled near the Pantai Cenang and Pantai Tengah area, with Bohor Tempoyak on Thursdays being the closest. A basic map will get you in the general area, but if you have any difficulties just asking a local, “Mana pasar malam?” will usually get you pointed in the right direction or just ask your taxi driver.